Congenital absence of the left main coronary artery (LMCA) or its ostium is an exceedingly rare congenital heart anomaly. The incidence of all types of coronary artery anomaly varies between 0.01% and 0.04% in forensic medicine following autopsy formation.,, Only a few patients with a combination of LMCA atresia and other cardiac anomaly were reported, and indeed, the concomitant presence of supravalvular aortic stenosis and left coronary artery ostial stenosis is an exceedingly rare phenomenon.,, Sometimes, atresia of the ostium or the left main trunk can be associated with congenital aortic valve stenosis, bicuspid aortic valve, mitral valve prolapse, and rarely supravalvar aortic stenosis. Our patient has four unique properties that rarely reported in the medical literature. The first special characteristic was large and well-developed right coronary artery (RCA) that running from distal posterior descending artery to the apex and then to interventricular septum and connected to the large diagonal artery. The second characteristic was the absence of collateral circulation as seen in the most cases of LMCA. The third property has referenced to the presence of supra-aortic valve stenosis (SVAS). The fort features were the presence of some collateral vessels from RCA to main pulmonary artery as a fistula. A 16-year-old male admitted to our center, with typical chest pain and electrocardiography (ECG) finding of anterolateral wall ischemia. He had an exercise-induced respiratory problem and dyspnea from 3 years earlier that his previous diagnostic workup as transesophageal echocardiography (TEE) was unremarkable; however, ECG was not found in his document that obtained in his record. Physical examination was unremarkable. ECG showed ST elevation in lateral leads and in V1 to V6 and aVL at the anterolateral wall. Chest radiography showed moderate enlargement of the cardiac silhouette with a normal cardiothoracic ratio. The blood gas examination was normal. Echocardiography revealed a moderately dilated left ventricular dimension with 50 mm, with no evidence of mitral regurgitation, hypokinesia of anterolateral wall, and reduced left ventricular ejection fraction (ejection fraction, 40%). TEE also showed supravalvar aortic stenosis (gradient of 67.5 mmHg) that confirmed by angiography. ECG showed ST elevation and Q wave in V1 to V6 and aVL at the anterolateral wall. TEE and ECG suggested coronary artery disease, and therefore, angiography was planned. Thallium 201 scintigraphy during exercise revealed a persistent ischemia in anteroseptal and lateral segments; angiography revealed the lengthy and dilated RCA, originated from normal site of the right coronary sinus. 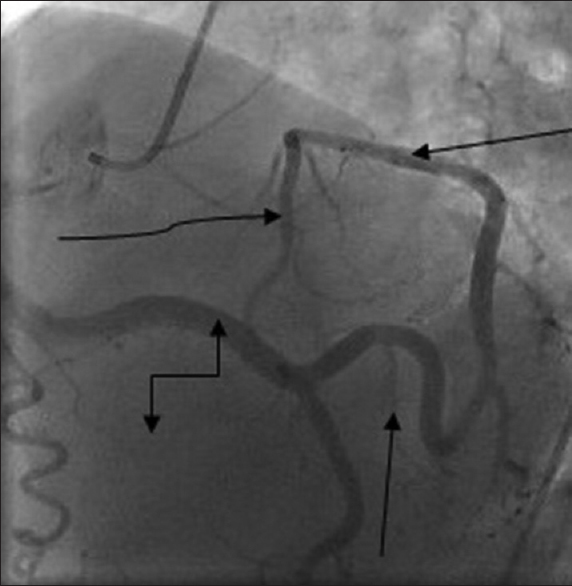 The origin of the LMCA was atretic and was not found in the left coronary sinus, and the left circumflex artery (LCX) and diagonal branches of the left coronary artery had normal size, especially diagonal artery was a well-developed artery and connected to RCA but left anterior descending (LAD) was small, thin with <1 mm diameter [Figure 1]. 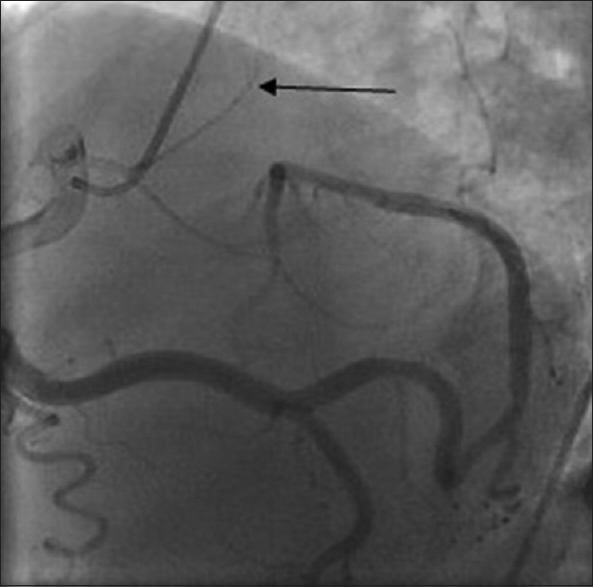 The LMCA, poorly developed LAD, normal LCX, and well-developed D artery were perfused retrogradely by abnormally dilated and tortuous RCA, in the absence of collaterals and looped branches as reported in the other studies [Figure 2]. In opposed to others, our case had an abnormal collateral flow into the pulmonary artery as a small fistula. The patient was scheduled for coronary artery bypass grafting (CABG) and repair of supravalvar stenosis. Due to ischemia in anterolateral wall, the induction was induced by sufentanil and cisatracurium. The patient was scheduled first for off-pump coronary artery bypass (OPCAB) surgery. Anesthesia was induced with sufentanil and atracurium and maintained by propofol midazolam, and sufentanil. The lungs ventilation was continued with 60% oxygen and air, so the arterial saturation was maintained between 97% and 98%. A central venous line through the right subclavian vein was inserted without any problem. OPCAB was performed through midline sternotomy and LIMA harvesting. 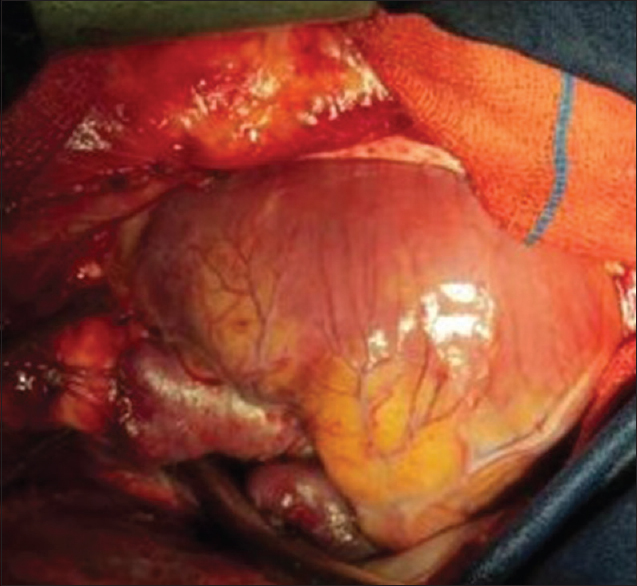 Then, CABG was performed with saphenous venous graft and LIMA graft was put on LCX and LAD, respectively [Figure 3]. During OPCAB, the mean blood pressure was maintained at a level of 80 mmHg or more, by using alpha receptor stimulation by phenylephrine; however, a short time of hypotension (3 min, 60/40 mmHg) was documented during bypass of the left circumflex coronary artery. Blood gas analysis, such as Pao2 and Paco2, was maintained to a normal level. On admission to the Intensive Care Unit, the anesthetic agents were discontinued, and with the absence of hemodynamic instability or active bleeding or serious arrhythmias and when the patient became awoke, he weaned from the mechanical ventilator. During the weaning, his hemodynamic status was stable, and he softly adapted the weaning process. The amount of postoperative drainage during the first, second, and third day of operation was 700 ml, 400 ml, and 200 ml subsequently. The volume of transfusion was 1200 mL of packed blood cells. The patient was conscious at the following morning, without any complaint of motor and sensory deficit in his lower extremities. No any wall motion abnormality detected during induction, during surgery, and postbypass period. After OPCAB, cardiopulmonary bypass was instituted with aortic and bi-caval cannulation. Following the aortic cross-clamping, transverse aortotomy with extension to both right and noncoronary sinuses was performed, and pantaloon-like defect was repaired with fresh pericardium [Figure 4]. Then, CABG was performed with saphenous venous graft and LIMA graft was put on LCX and LAD, respectively [Figure 3]. Postoperative course was uneventful, and the patient was discharged on the 7th day of operation. One-year follow-up showed relief of his preoperative symptoms, and TEE revealed a normal size of ascending aorta with normal function of the aortic valve. To the best of our knowledge, concomitant diagnosis of LMCA with congenital stenosis of the ascending aorta and survival without collateral arteries with the presence of only dominant RCA has not been previously reported. Congenital abnormalities of the coronary artery orifice such as single coronary artery (SCA) atresia and acute angle takeoff with tangential course are rare congenital heart diseases; we report a rare case of symptomatic SCA anomaly with combination of SVAS that undergone bypass and repair of SVAS. Yamanaka O, Hobbs RE. Coronary artery anomalies in 126,595 patients undergoing coronary arteriography. Cathet Cardiovasc Diagn 1990;21:28-40. Ogden JA. Congenital anomalies of the coronary arteries. Am J Cardiol 1970;25:474-9. Sharbaugh AH, White RS. Single coronary artery. Analysis of the anatomic variation, clinical importance, and report of five cases. JAMA 1974;230:243-6. Koh E, Nakagawa M, Hamaoka K, Sawada T, Oga K. Congenital atresia of the left coronary ostium: Diagnosis and surgical treatment. Pediatr Cardiol 1989;10:159-62. Harada K, Ito T, Suzuki Y, Shiota T, Shimada K, Takada G, et al. Congenital atresia of left coronary ostium. Eur J Pediatr 1993;152:539-40. Hauwaert LG, Dumoulin M, Moerman P. Congenital atresia of left coronary ostium. Br Heart J 1982;48:298-300. Engel HJ, Torres C, Page HL Jr. Major variations in anatomical origin of the coronary arteries: Angiographic observations in 4,250 patients without associated congenital heart disease. 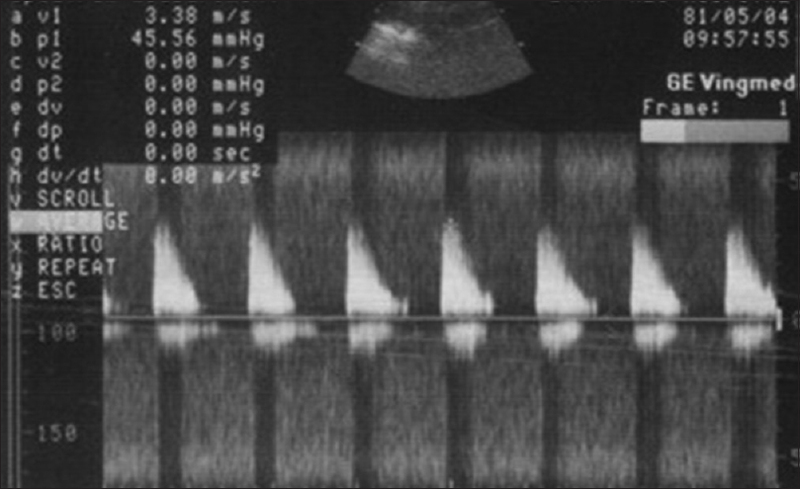 Cathet Cardiovasc Diagn 1975;1:157-69. Serraf A, Baron O, Nottin R, Lacour-Gayet F, Bruniaux J, Sousa Uva M, et al. Atresia or congenital stenosis of the left coronary ostium. Myocardial revascularization in 5 children. Arch Mal Coeur Vaiss 1993;86:587-91. Manasek FJ. Embryonic development of the heart. I. A light and electron microscopic study of myocardial development in the early chick embryo. J Morphol 1968;125:329-65. Virágh S, Gittenberger-de Groot AC, Poelmann RE, Kálmán F. Early development of quail heart epicardium and associated vascular and glandular structures. Anat Embryol (Berl) 1993;188:381-93. Virágh S, Challice CE. The origin of the epicardium and the embryonic myocardial circulation in the mouse. Anat Rec 1981;201:157-68.